By the fall of 1718, Blackbeard had returned to his wicked ways in full force. Merchants and planters alike complained about the lack of action on the part of Governor Charles Eden, who may or may not have been colluding with the pirate. North Carolina residents appealed to Virginia’s Governor Alexander Spotswood instead. Governor Spotswood would not stand for piracy in his waters and summoned Captains Ellis Brand and George Gordon of the British Royal Navy to discuss a strategy. As an additional incentive, Spotswood offered a bounty for the pirate: 100 pounds, dead or alive. The two captains were eager to assist. Since the captains’ two warships, HMS Pearl and Lyme, were too large to ply the coastal waters of North Carolina, two smaller civilian vessels, Ranger and Jane, were chartered for service, with Spotswood paying the merchants out of his own pocket for use of the two ships. The vessels were quickly outfitted with small arms and swivel guns. Due to the rumors surrounding Governor Eden’s complicity in Blackbeard’s illicit activities, Governor Spotswood neglected to inform his southern neighbors of his plans. Lieutenant Robert Maynard, first officer of Pearl, was given command of Jane to lead the attack by sea. With only 57 men, Maynard quietly approached the pirate’s camp at Ocracoke on the evening of November 21. They would wait until dawn to attack. Carousing through the night with his men, Blackbeard was unaware of the advancing forces until daybreak when the vessels were finally spotted and the alarm was raised. 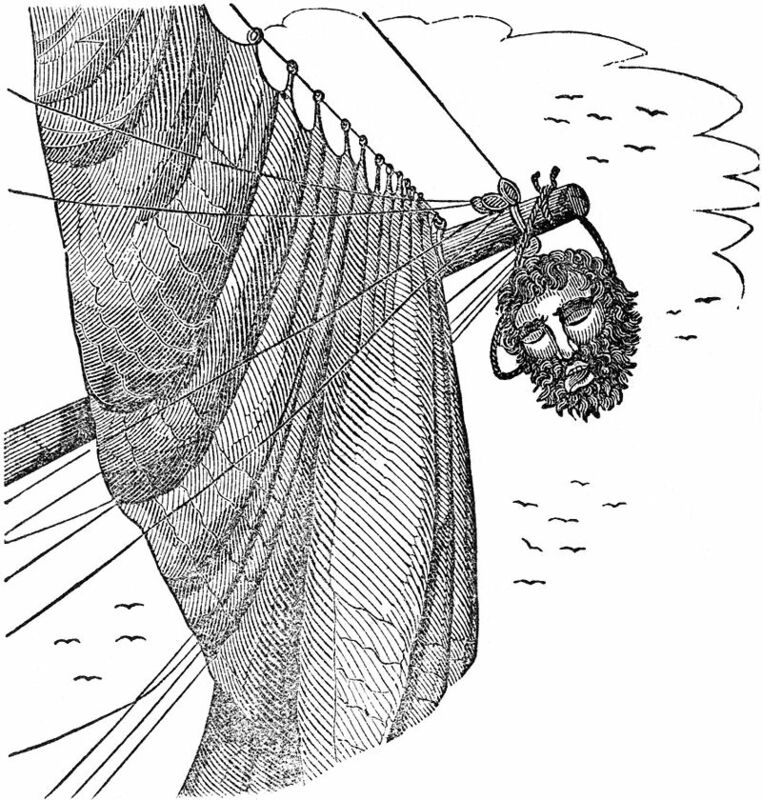 Blackbeard ordered the anchor cable cut and turned his sloop Adventure so that Maynard would be forced to pursue shoreward and unknowingly run his ships aground. Within minutes, both Jane and Ranger were stuck. With Maynard at a disadvantage, Blackbeard ordered a broadside, killing and wounding several British officers. Adventure became stranded in the melee, and the pilot of Jane saw an opportunity to cruise nearer once the ship became freed. Jane plowed straight into Adventure, provoking a volley of gunfire from the pirates, followed by Blackbeard boarding Jane with most of his men. The ensuing battle lasted only a few minutes. 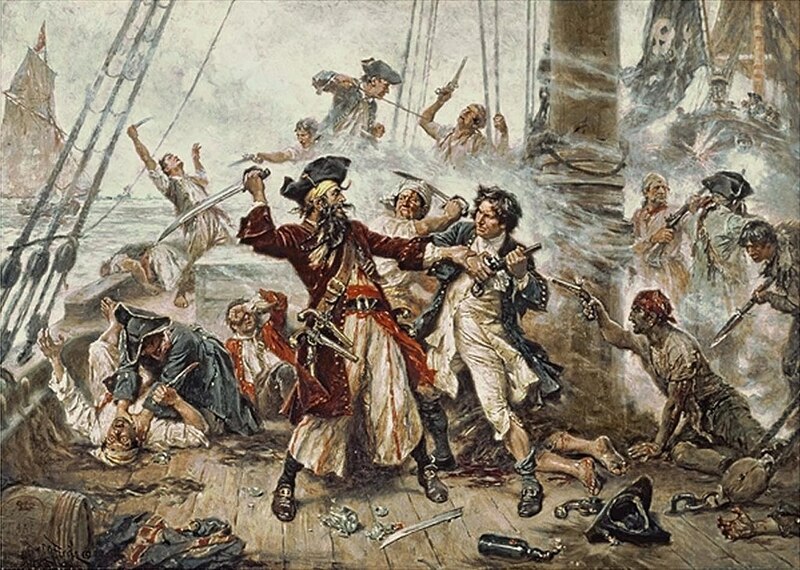 Blackbeard confronted Maynard directly, and both men fired at each other. Blackbeard missed. Despite taking a direct shot in the chest, the pirate continued fighting, until finally succumbing to additional gunfire and sword wounds. It is said that in a grizzly move, Maynard severed the ferocious pirate’s head and sailed back to Virginia with it tied to his bowsprit as a trophy and as a warning to other pirates to avoid the same fate. On November 22, 1718, the most fearsome pirate to sail the seas was defeated after a year-and-a-half long reign of terror. It was a brief but fiery career. For Blackbeard’s legacy, however, death was only the beginning. -Butler, Lindley. Pirates, Privateers, and Rebel Raiders of the Carolina Coast. Chapel Hill: University of North Carolina Press, 2000. -Konstam, Angus. Blackbeard: America’s Most Notorious Pirate. Hoboken, NJ: John Wiley and Sons, 2006. --Johnson, Charles. A General History of the Pyrates, second edition. London: printed for, and sold by T. Warner, 1724. -Inset of Ocracoke Inlet, from Moseley, Edward. A new and correct map of the Province of North Carolina, 1733. 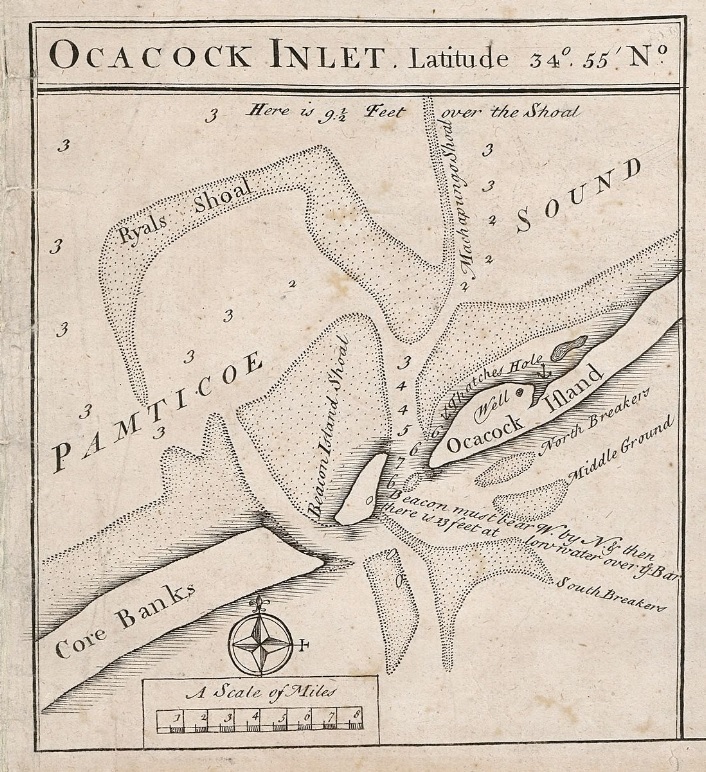 Original map held by East Carolina University, Joyner Library.